Sportsbook.com was established back in 1997. Sportsbook.com and PlayersOnly have the same founders. Sportsbook.com has a poker room for U.S. and Canadian players. 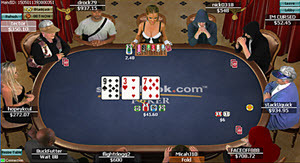 Examples of poker variants offered here are Texas Hold’em, Omaha HiLo and Seven Card Stud HiLo. The software is well-made and easy to use, and you can make various adjustments. Multi-tabling works great. At the average cash table, approximately 65 hands are dealt per hour, when the table is fully occupied. A lot of statistics is available to you about your game, so that you can analyze it. You can select between two different options when you make your first deposit. 100% match bonus up to a maximum of $650. After your first deposit, you will be invited to a Welcome Freeroll with a $500 prize pot. These bonus offers are only available to players that download and install the poker software. Collect loyalty points when playing cash games and buying into tournaments. 375 loyalty points can be exchanged for $5 of bonus money. The poker room often have campaigns running, such as The Million Dollar Points Race, Bad Beat Jackpot tables, MIT Leaderboards, SnG Leaderboards, and more. As the name suggests, Sportsbook.com is a big sports book with a great odds offering. You can also play casino games here. The Sportsbook.com customer support can be reach by phone, email and live chat. It is open 24/7. The smallest deposit allowed is $20. You can deposit up to $1,000 per day, but not more than $6,000 per month.